DANIEL KABLAN DUNCAN, Minister for Foreign Affairs of Côte d’Ivoire, speaking on behalf of President Alassane Ouattara, said the President was doing all possible to reach sustainable solutions in Côte d’Ivoire and in the region. Security in Western Africa was seriously undermined by the military-political crises orchestrated by the rebel and terrorist movements, particularly in Mali and Guinea-Bissau. Stressing the tireless efforts by ECOWAS to restore order in those countries, he said the Community planned to deploy military force to help the Malian army defend the country’s territorial integrity. That required major support from the African Union, the United Nations and all development partners, he added, warning that the presence of terrorist groups in northern Mali could lead to the implosion of the Western African region and Sahel. “It is clear how incomplete the current instruments are for resolving these crises”, he said given the role of non-State players in those conflicts. Stressing that the resurgence of terrorists in Sahel and northern Mali had created a lawless zone, affecting Western Africa and which could eventually affect Europe, he called for concerted action by ECOWAS, the African Union, the United Nations and the European Union, and welcomed the appointment of a United Nations coordinator to combat terrorism. Turning to other matters, he noted that, since the West African coast was one of the six main centres of piracy in the world, he welcomed the ECOWAS meeting in June to take measures against piracy and organized transnational crime and the Secretary-General’s proposal to facilitate a meeting of Heads of State and to create a strategy with the African Union. 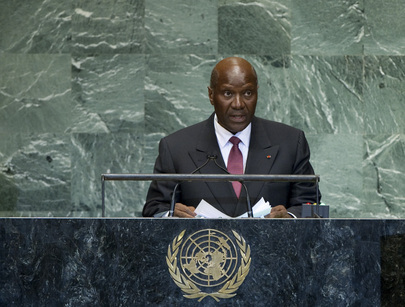 Noting that Côte d’Ivoire sought the adoption of a legally binding treaty on arms trade, he said the international community should not lose the opportunity to regulate, if not prohibit, a trade that led to the deaths of so many. He also expressed support for the concept of “responsibility to protect”, as an important instrument of prevention and peaceful resolution of conflict. Concerning Security Council reform, he favoured permanent membership for Africa and a right to veto. The reform of the Council could be a historic opportunity to repair an “anomaly in international relations”. With the valuable support of international community, especially the United Nations, Côte d’Ivoire had been able to emerge from a crisis that had hampered its economic and social development for more than a decade, he said. A programme for post-conflict reconstruction had been put in place covering political, economic, social, security, and humanitarian arenas. Results were made possible through the implementation of three areas of action: security and stability; national reconciliation through the creation of the Dialogue, Truth and Reconciliation Commission; and reconstruction and economic resurgence evidenced by a GDP growth of 8 per cent in 2012. The economic situation had improved considerably with the support of development partners, particularly since the implementation of the poverty reduction strategy in June, which would allow Côte d’Ivoire to soon achieve an economic growth of more than 10 per cent — essential to turn it into an emerging country by 2020.